Nimbly and effectively layering together detection and authentication that evolve with fraud is a challenge for businesses. Boston, September 14, 2017 – An intuitive and easy user experience is now table stakes in digital commerce, but as an increasing proportion of banking and retail transactions move into the online and mobile channels, criminals are following with rapidly evolving and innovative attacks. This presents businesses with a difficult conundrum: How can they balance the need for elegant user experiences with effective fraud prevention? 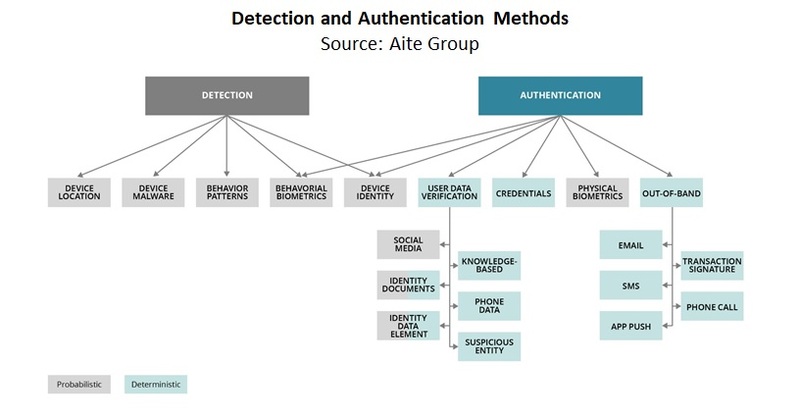 This report defines the various digital channel fraud detection and authentication solutions, discusses their pros and cons, and provides a vendor mapping. It is sponsored by Visa and contains analysis from ongoing, in-depth Aite Group discussions with senior fraud and business-line executives at global FIs, payment networks, merchants, and fraud and authentication vendors. This 28-page Impact Report contains eight figures and 12 tables. Clients of Aite Group’s Retail Banking & Payments service can download this report, the corresponding charts, and the Executive Impact Deck. This report mentions 41st Parameter, Accertify, ACI Worldwide, Acuant, Acxiom, Agnitio, AimBrain, Amazon, Apple, Apruvd, Au10tix, AuthenticID, Aware, BAE Systems, BehavioSec, BioCatch, BioConnect, BioTrust, Bottomline Technologies, Brighterion, CardinalCommerce, ClearSale, CyberSource, Danal, Daon, Dashlane, DataVisor, Delta ID, Early Warning Services, Easy Solutions, Emailage, Encap Security, Entersekt, Entrust Datacard, Equifax, Ethoca, Experian, EyeVerify, F5, Facebanx, Facebook, Feature Analytics, Feedzai, FICO, FIS, Fiserv, Forter, Fujitsu, Gemalto, GreenKey, Guardian Analytics, HID Global, Hitachi, Hypr, IBM, ID Analytics, IdentityMind, IDology, InAuth, iovation, iSoft, Jack Henry, Jumio, Kofax, Kount, LexisNexis Risk Solutions, Lexmark, LocationSmart, LookingGlass, Mastercard, Microsoft, Mitek, NEC, Neuro ID, Neustar, Nice Actimize, Nice Systems, Nok Nok Labs, Norse, Nuance, NuData Security, Nymi, Oberthur Technologies, Ondot, One Visage, Oracle, OT-Morpho, Payfone, Pindrop Security, Phish Labs, Radial, Risk Ident, Riskified, RSA Security, Recorded Future, SAS, SayPay Technologies, SecuredTouch, SecureKey, Sensory, Sestek, Sift Science, Signifyd, Simility, Socure, Symantec, Terbium Labs, Telesign, ThetaRay, ThreatMetrix, TransUnion, Trusona, Validsoft, Vasco, Verifi, Verint, Vesta, Visa, Vix Verify, Voice Biometrics Group, VoicePIN, VoiceVault, Wipro, Zoot, and Zumigo.